Working together to enable your digital growth. Managing global tax compliance is not a ‘one-size-fits-all’ process. Every business is different, with its own unique requirements. Taxamo partners with you to understand your needs and objectives. We then work closely with your team to design a practical, global VAT/GST compliance strategy to deliver your goals. Our modular service makes it easy for you to meet the tax requirements of all the countries you sell to. 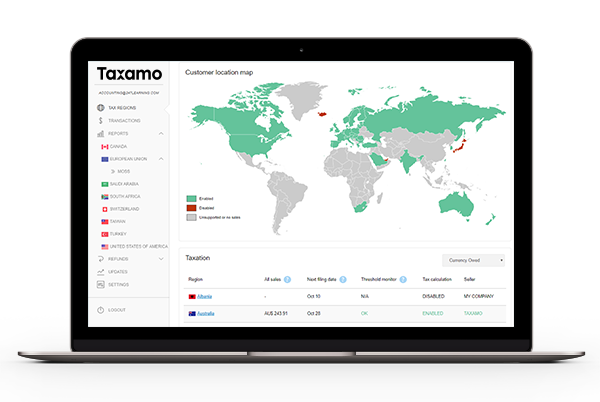 Choose the VAT/GST compliance service and functionality that best suits your business per country/region today, with the ability to enhance your Taxamo service design as your commercial needs change. With two 'mix-and-match' services, Taxamo Advantage and Taxamo Intermediary Plus, we have the perfect model to fit your business. Our tax software allows businesses to create VAT/GST-compliant tax reports, which you can then use to file and remit your tax in each country where you have these obligations. This is the same software that Taxamo uses to manage its tax risk globally. When a customer purchases a service on your website, Taxamo’s compliance algorithm ensures the correct tax treatment and calculation for that transaction in real-time. Taxamo supports both one-time and recurring transactions. We hold the evidence collected on the initial transaction so its VAT/GST rate can be determined for any subsequent transactions. We also support any upgrades/downgrades throughout the recurring transaction lifecycle and reflect them accurately in appropriate tax reports and filings. Taxamo’s B2B service validates local business numbers in real-time. Compliantly manage your B2B sales processes - including offering reverse charge (no-VAT/GST) - to business customers in countries that support it. Because invoicing requirements vary from country to country, they can be complex to manage. Taxamo offers compliant invoicing across multiple rules: from language requirements to lottery number support, in every country we support. So, you don’t need to worry. Taxamo compliantly calculates Foreign Exchange (FX) for multiple currencies, supporting sales in any currency in any country. Data storage for audit purposes varies by country (e.g. 10 years in the EU). Our solution meets all data storage compliance requirements for the countries we support - meaning your data will always be audit-ready. Transaction-related data is stored in the cloud and replicated between data centers for failover and fault tolerance. We use AWS data centers within the European Union. You can access all of your data at any time - either via our API or by the reporting and exporting facilities in our dashboard. Taxamo Intermediary Plus* allows businesses to use the Taxamo technology platform to support the distribution of digital service sales globally. As a platform, Taxamo is liable for VAT/GST obligations on the sale. So, for countries where you use Taxamo Intermediary Plus, your business will not need to register with the local tax authority or file and remit VAT/GST. You won’t need to appoint a tax agent. Taxamo will manage foreign exchange (FX) calculation and take on FX fluctuation exposure. There’s more. Taxamo has the liability for filing inaccuracies or any potential late fees or penalties exposure, with the relevant tax authority. The role of the Taxamo technology platform is in line with OECD Intermediary recommendations to improve tax collection in the context of the ‘the place of supply rule’ for VAT/GST. Such rules are increasingly being applied by local tax authorities globally. *This service is not yet available in the United States, Japan, and South Africa. Through our Intermediary Plus service, Taxamo becomes part of your supply chain to facilitate the sale of digital services. This means Taxamo is liable for VAT/GST owed on these digital sales globally. The Taxamo technology platform collects, files and remits the VAT/GST due on these digital sales to the relevant local tax authorities. Taxamo integrates seamlessly into your existing customer journey without disrupting existing processes. Taxamo registers in the countries where foreign digital businesses are required to do so, removing the need for your company to research rules and registration requirements. With Taxamo you no longer need to spend time and effort sourcing a tax agent in the many countries that, by law, require you to do so. Taxamo settles the VAT/GST due on the digital service sales directly with the relevant tax authorities, in local currencies. Taxamo has the liability for all VAT/GST obligations on digital service sales, including penalties and fines for late, incorrect, or non-payment of VAT/GST with each local tax authority. Taxamo manages global FX exposure, protecting you against the risk of global rate fluctuations.